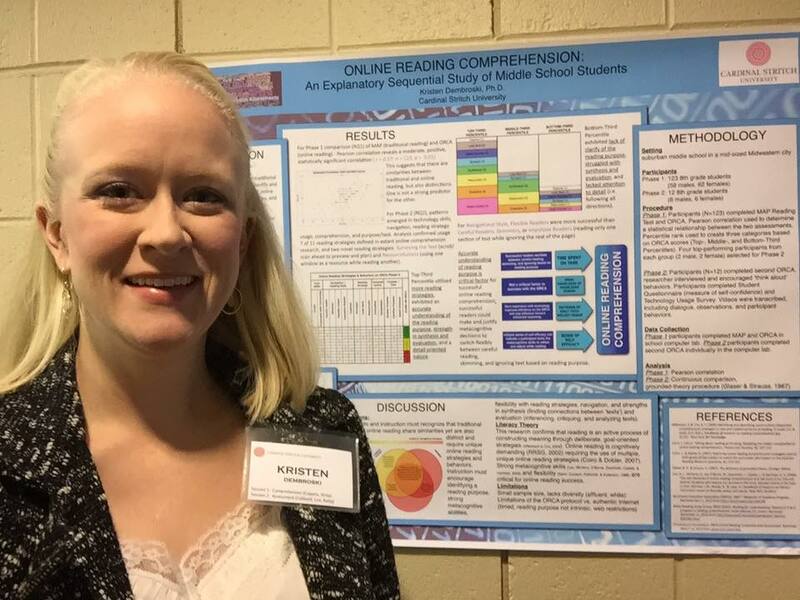 New Research in Literacy | Kristen Dembroski, Ph.D.
Students SHOULD read frustration level texts. And all this time, we thought we should be giving students texts at their instructional level. There are some inherent flaws in that arrangement, though. If we don’t model strategies and comprehension with frustration level texts, how will they ever progress? Secondly, if we are giving them only instruction level texts (which are below grade level for intervention students), then they will never catch up to grade level, and we aren’t using the same level of cognitively demanding material. Grade level material will have more complex sentence structure, vocabulary, content, and depth. THAT is what our students need. Interventions need to focus on TRANSFERRING skills to the classroom. It seems a simple enough concept, but how often do we actually acknowledge or work on this skill? What students learn in intervention should directly tie into the classroom learning. They should be reading a text at a similar level (but perhaps on a different topic), and we should focus on what Dr. Caldwell calls ‘concept free’ questions, or questions that aren’t directly tied to the topic at hand (ex: What is the theme of this story? How did the author organize this text?) I think LLI or Leveled Literacy Instruction does a great job of modeling these skills. Students can’t just jump in to a Close Reading. They need to get the gist of the story first. They need to recognize and acknowledge the topic, textual features, linguistic features, organization of the text, etc. Intertextual connections is a critical skill we often gloss over in school. This means making connections BETWEEN two or more texts. How do they overlap? Agree? Differ? This is a skill that must be explicitly modeled and taught. There’s a new reading comprehension assessment, and you’re gonna want to buy it. Have you ever given the QRI and thought, “This is such a wonderful tool, but it is so time consuming and laborious to give one on one. I wish I could give it to my whole class at once.” Well, you might like to know about JoAnn Caldwell’s newest tool, the CARA: Content Area Reading Assessment. It is an assessment of reading comprehension across the disciplines. At each grade level, there are 3 literature, 3 science, and 3 social studies passages. Yes, that means you can do a beginning of the year, mid-year, and summative assessment (Hello, SLO!). It is aligned to the common core, and it could serve as a wonderful modeling tool for teachers looking for assistance writing standards based questions from text. There is a new kind of passage called the Inferential Diagnostic Level passage. The passage type we are familiar with, Level Diagnostic, are still there as well. However this new kind of passage is designed to be read orally or silently in chunks. The reader pauses to respond orally or in writing to intermittent inference questions. The reader is allowed to look back at the text right away. Passages are a bit longer than we are used to, and readers provide a more concise summary at the end. Level diagnostic passages from level 6 and up are no longer labeled as just ‘narrative’ and ‘expository,’ but now also include the discipline (i.e. science, literature, social studies, etc.). I asked Dr. Caldwell if that meant we had to give multiple expository selections to diagnose a student’s level, and she said no – either science or social studies would be fine. However, she also clarified that she might lean toward science, since it is markedly different from literature. Self-corrections during the miscue analysis do NOT count. The prior knowledge questions now have sample responses to help with scoring. There is no longer a prediction question prior to reading. There is now an Oral Reading Prosody Scale adopted from NAEP. The retelling section is shorter with fewer points – many shorter ideas were combined. I truly enjoyed this conference, and plan to promote and attend again next year. I made a lot of wonderful new connections, and learned some invaluable concepts to enhance my classroom and university level instruction. And, I got to present my own research as well! Okay – it’s been a while. Please remind me what the specs are on frustration/instructional reading levels. And what about how much they should be reading at each of these levels? And the CARA book is 2 years old on Amazon. So did it take this long to catch fire? Did she say? Frustration level will depend on the assessment tool you are using to measure students. For example, the QRI would say frustration is 70% or less on reading words in isolation, 90% or less on passage miscues for acceptability (meaning-changing only) and being able to answer 5 or fewer (out of 8) explicit / implicit comprehension questions after reading a text. For Fountas & Pinnell LLI, frustration would be 95% or less oral reading fluency and ‘limited / no proficiency’ based on the comprehension questions that follow a passage. In general, I would say frustration is when a student doesn’t ‘get’ at least 90% of a passage – comprehension, fluency, vocabulary, etc. I personally would recommend that a student read frustration level text with assistance – such as in the classroom or in an intervention – but read instructional or independent level texts on their own (for pleasure). The CARA was totally new to me as of this past weekend. I guess it hasn’t ‘caught fire’ yet! But with the release of the QRI-6, we are beginning to see the connections between the 2. The CARA is very similar to the inferrential diagnostic level passage in the new QRI-6.